I didn’t become aware of the lute’s important place in the story of music until I was in my late twenties. I had been studying recorder seriously for a couple of years in the early 1990s and put together a recital with a friend of mine named Mary Guthrie who is a classical guitarist. We played sonatas by Händel and Telemann (she played the continuo transcribed for guitar), we each played some solo pieces, and to fill out the program she asked me to sing some songs by John Dowland (in guitar transcription). It was my first acquaintance with Dowland’s music – or with lute songs in general for that matter – and I was quickly enamored with Dowland’s masterfully crafted miniatures. Shortly afterwards I came across Ronn McFarlane‘s CD The Lute Music of John Dowland at Tower Records, which began my tumble towards the rabbit hole…I was immediately entranced by the sound of the instrument, and began to learn as much about the repertoire as I could. At this time the internet was still in its infancy and e-commerce as such didn’t exist. Luckily I lived in New York: Tower Records was still around, and there were stores close to the paths I usually travelled. I began to collect recordings by Ronn and other lutenists like Paul O’Dette and Hopkinson Smith, and one day, seeing an old lute in a Manhattan pawn shop, I bought it on impulse. 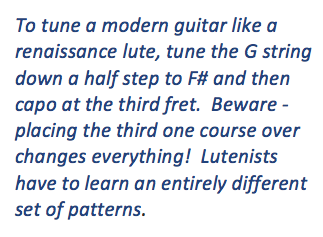 I found Diana Poulton‘s A Tutor for the Renaissance Lute at Patelson’s along with some small collections of easy pieces, and…down the rabbit hole. I was extremely fortunate to soon find myself in the mid-town Manhattan studio of Pat O’Brien, who taught me how to play the lute. of roughly 400-500 years from the 14th – 18th centuries. 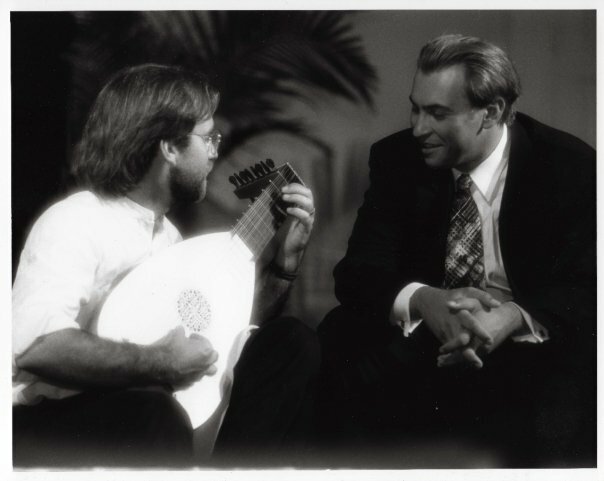 There is some tradition that the lute was brought back to Europe by the crusaders – and although there is scholarly argument about how this came about, the European lute shares many characteristics with the oud, the staple lute family instrument of many Middle Eastern musical cultures. Medieval lutes had 4 or 5 courses – a course is a pair of strings (strung in unison for notes tuned to higher pitches or in octaves for lower pitches) strung adjacent to each other and played together, in the same manner as a contemporary 12-string guitar. The lute appears in iconography as early as the 12th century, and its use spread throughout Europe during the period. No written music for medieval lute survives (although this hasn’t stopped contemporary performers from trying to reconstruct it or take a stab at what it might have sounded like). During the medieval period the instrument was played with a quill, but towards the end of the 15th century, lutenists began to discard the use of a plectrum and began playing with their fingers, allowing them to play polyphonic music (music with more than one melodic part occurring simultaneously, e.g. counterpoint) which was a predominant style of music throughout the renaissance and baroque periods. The invention of the printing press around 1440 and the spread of this technology during the second half of the 15th century paved the way for the rise of secular instrumental music in the 16th century, with music for the lute at the forefront of this revolution. 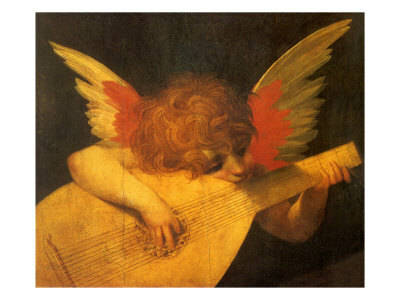 For the most part, throughout the 16th century the lute was a 6-course instrument. The highest string, called the chanterelle, was almost always single, and the other courses were double strung. It was tuned in fourths, like a modern guitar, with a major third between the third and fourth courses. From lowest to highest course, a renaissance tenor lute (probably the most common instrument of the family) is tuned: GG – C – F – A – d – g. In the early part of the century it was common to string the lowest three course in octaves (the second and third in unisons), but towards the end of the century some lutenists began to string their courses all in unisons. Venetian publisher Ottaviano Petrucci produced the first printed book of lute music in 1507, which was followed by a growing flood of printed collections and instruction books over the course of the century in Italy, France, Germany, and England. In Spain, the lute’s counterpart was the flat-backed instrument known as the vihuela (viola de mano in Italy) which was tuned identically, making music for lute or vihuela virtually interchangeable and playable on either instrument. The lute is constructed almost entirely of wood, and is surprisingly light. Traditionally the only materials besides wood that are used are glue, bone for the nut and gut for the strings. Contemporary players often use modern alternatives to gut for strings – gut is expensive and volatile – but for the last generation or so luthiers have been building instruments modeled on historical originals which adhere to the other traditional aspects of construction. Thin strips of wood are glued together over a mold to make the deep body of a lute – the resonator that gives the instrument its characteristic timbre. Building lutes is an intricate and time-consuming process, and they must be made by hand by a skilled craftsman, hence good instruments are hard to find and most often must be commissioned. Lute music is written in tablature, a system of notation that depicts where the notes are to be played on the instrument using a composite rhythm notation, rather than the more abstract conventional music notation that depicts pitches. There were three systems of lute tablature in use during the renaissance: Italian, French, and German. 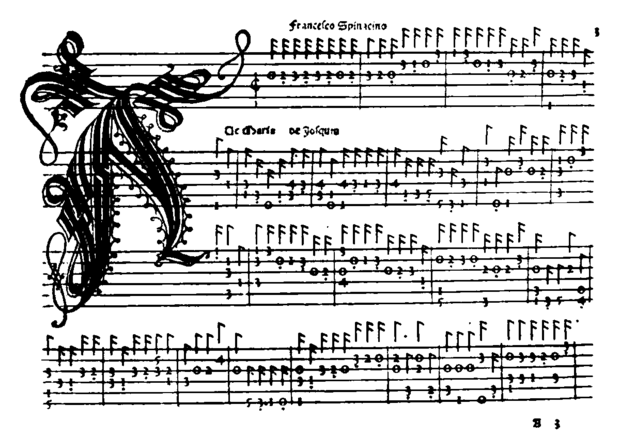 Italian tablature (depicted above) uses numbers to denote which fret is to be played, and the six-line “staff” denotes the six courses of the lute, with the lowest course at the top – the tablature mirrors the instrument in the player’s hands. French tablature, which found wider use throughout the continent and eventually supplanted Italian tablature in the 17th century, uses letters instead of numbers and inverts the “staff” with the letters denoting the notes to be played on the chanterelle placed on the top line. Finally, German tablature does away with the use of any lines at all, and uses an extensive set of letters to denote every single fretted note on every string – when the system runs out of Roman letters, it uses Greek letters. Lutenists today use French tablature as the primary system of notation, while more accomplished players or those with a strong interest in the Italian repertoire (there is a tremendous amount of high quality Italian music for lute) may also be proficient with Italian tablature. Players who can read and play from German tablature are few and far between – most players who want to play German music play from transcriptions into French tablature. As with the rest of the Renaissance, the Italians led the way. Manuscripts and printed collections of Italian lute music from the 16th century feature music by many, many composers with names like Joanambrosio Dalza, Vincenzo Capirola, Vincenzo Galilei (the father of Galileo), Marco Dall’Aquila, Giovanni Antonio Terzi, Simone Molinaro, and the prolific composer Anonymous (also known as Unattributed) whose works dominate many manuscripts. But towering above them all is the most famous lutenist of the Italian Renaissance – almost unknown today – and the first great instrumental virtuoso of Western art music, Francesco Canova da Milano. By walterbitner in Early Music, Medieval, Meet, Renaissance, The Lute on September 20, 2015 . Thank you for this important commentary Ian!